Increasing motor operating efficiency potentially reduces energy consumption and radiator requirements. In some applications, the motor’s operating efficiency may even be the most important factor to be considered. The model-based minimum total loss control (MTLC) we proposed could potentially improve motor efficiency by taking copper and iron loss into account based on the motor model, finding the minimum power point, and enabling the permanent magnet synchronous motor achieve optimal efficiency at different speeds. 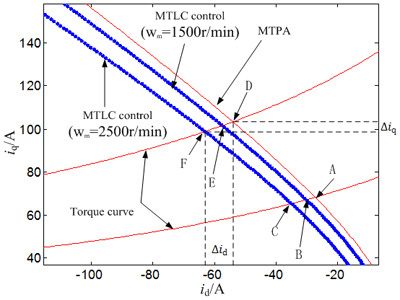 Copper loss under MTLC increased less than the maximum torque per ampere (MTPA), but iron loss under MTLC was much lower than MTPA, reducing total loss. MTLC reduced total loss by adjusting the relation between copper and iron loss using a demagnetization current. Analysis and simulation results show that our proposal improved the efficiency of the permanent magnet synchronous motor effectively, making it easy to implement in practical control with little calculation. G. Li, Z. Yang, L. Song, and G. Dong, “Model-Based Minimum Total Loss Control of Interior Permanent Magnet Synchronous Motor,” J. Robot. Mechatron., Vol.28, No.5, pp. 633-639, 2016. A. Kamalaselvan and S. L. Prakash, “Modeling simulation and analysis of closed loop speed control of PMSM drive system,” Int. Conf. on Circuit, Power and Computing Technologies (ICCPCT), pp. 692-697, 2014. L. Zheng and L. Hongmei, “MTPA control of PMSM system considering saturation and cross-coupling,” 15th Int. Conf. on Electrical Machines and Systems (ICEMS), pp. 1-5, 2012. K.-W. Lee and S. B. Lee, “MTPA operating point tracking control scheme for vector controlled PMSM drives,” 2010 Int. Symposium on Power Electronics Electrical Drives Automation and Motion (SPEEDAM), pp. 24-28, 2010. J. Ningzhi et al., “Sliding mode based speed regulating of PMSM MTPA control system for electrical vehicles,” 2011 Int. Conf. on Electronic and Mechanical Engineering and Information Technology (EMEIT), pp. 987-992, 2011. W. Xiaoyuan et al., “Design Optimization and Eddy Current Losses Analysis of Permanent Magnets in PMSM,” 2006 12th Biennial IEEE Conf. on Electromagnetic Field Computation, pp. 187-187, 2006. L. Liyi et al., “Research of core loss of permanent magnet synchronous motor (PMSM) in AC servo system,” ICEMS 2008 Int. Conf. on Electrical Machines and Systems, pp. 602-607, 2008. T. Finken and K. Hameyer, “Design and optimization of an IPMSM with fixed outer dimensions for application in HEVs,” Electric Machines and Drives Conf. 2009 (IEMDC ’09), IEEE Int., pp. 1743-1748, 2009. M. Mutluer and O. Bilgin, “Design optimization of PMSM by particle swarm optimization and genetic algorithm,” 2012 Int. Symposium on Innovations in Intelligent Systems and Applications (INISTA), pp. 1-4, 2012. M. Nasir Uddin and B. Patel, “Loss minimization control of interior permanent magnet synchronous motor drive using adaptive backstepping technique,” 2013 IEEE Industry Applications Society Annual Meeting, pp. 1-7, 2013. S. Morimoto et al., “Loss minimization control of permanent magnet synchronous motor drives,” IEEE Trans. on Industrial Electronics, Vol.41, pp. 511-517, 1994. J. Siahbalaee and S. Vaez-Zadeh, “Model-based loss minimization of direct torque controlled permanent magnet synchronous motors,” 2010 1st Power Electronic & Drive Systems & Technologies Conf. (PEDSTC), pp. 273-278, 2010. E. S. Sergaki et al., “Fuzzy logic based online electromagnetic loss minimization of permanent magnet synchronous motor drives,” 18th Int. Conf. on Electrical Machines, pp. 1-7, 2008. M. N. Uddin and R. S. Rebeiro, “Online Efficiency Optimization of a Fuzzy Logic Controller Based IPMSM Drive,” IEEE Industry Applications Society Annual Meeting, pp. 1-8, 2009. E. S. Sergaki and G. S. Stavrakakis, “Online search based fuzzy optimum efficiency operation in steady and transient states for DC and AC vector controlled motors,” 18th Int. Conf. on Electrical Machines, pp. 1-7, 2008. M. A. Al-Taee et al., “Real-time efficiency optimisation of open-loop controlled synchronous PM motor drive using Adaptive Neural Networks,” EUROCON – IEEE Int. Conf. on Computer as a Tool (EUROCON), pp. 1-4, 2011. Z. Wu et al., “Efficient optimization control of permanent magnet synchronous motor using artificial neural network,” Advances in Information Sciences and Service Sciences, Vol.3, pp. 260-267, 2011. C. Cavallaro et al., “Efficiency Enhancement of Permanent-Magnet Synchronous Motor Drives by Online Loss Minimization Approaches,” IEEE Trans. on Industrial Electronics, Vol.52, pp. 1153-1160, 2005. T. Senjyu et al., “Parameter measurement for PMSM using adaptive identification,” 2002 IEEE Int. Symposium on Industrial Electronics, pp. 711-716, 2002. G. Shen et al., “Adaptive control approach for PMSM based on parameter identification: A simulation perspective,” 2014 Int. Conf. on Information Science, Electronics and Electrical Engineering, pp. 835-839, 2014. S. Wang et al., “Parameter identification of PMSM based on Windowed Least Square algorithm,” 2011 Int. Conf. on Manufacturing Science and Technology (ICMST 2011), pp. 5940-5944, 2012. W. Wang and X. Xi, “Research on predictive control for PMSM based on online parameter identification,” 38th Annual Conf. on IEEE Industrial Electronics Society (IECON 2012), pp. 1982-1986, 2012. D. Xu et al., “Precise current control of PMSM based on parameter identification,” Dianli Zidonghua Shebei / Electric Power Automation Equipment, Vol.28, pp. 30-35, 2008. L. Yang et al., “On-line adaptive control of PMSM current-loop based on parameter identification,” Diangong Jishu Xuebao/Trans. of China Electrotechnical Society, Vol.27, pp. 86-91, 2012. R. Kumar et al., “Novel topologies for identification and control of PMSM using artificial neural network,” Information and Communication Technology in Electrical Sciences (ICTES 2007), pp. 75-80, 2007. R. Kumar et al., “Identification and Control of PMSM Using Artificial Neural Network,” IEEE Int. Symposium on Industrial Electronics (ISIE 2007), pp. 30-35, 2007. J. N. H. Pérez, “Parameter Identification of a Permanent Magnet Synchronous Machine based on Current Decay Test and Particle Swarm Optimization,” Latin America Trans., IEEE (Revista IEEE America Latina), Vol.11, pp. 1176-1181, 2013. S. Wang and S. Wan, “Identify PMSM’s Parameters by Single-Layer Neural Networks with Gradient Descent,” 2010 Int. Conf. on Electrical and Control Engineering (ICECE), pp. 3811-3814, 2010. T. Boileau et al., “On-line identification of PMSM parameters: Model-reference vs EKF,” 2008 IEEE Industry Applications Society Annual Meeting (IAS’08), 2008. X. Jiang et al., “Modeling and simulation of parameter identification for PMSM based on EKF,” 2010 Int. Conf. on Computer, Mechatronics, Control and Electronic Engineering (CMCE 2010), pp. 345-348, 2010. T. Senjyu et al., “Parameter measurement for PMSM using adaptive identification,” Proc. of IEEE Int. Symposium on Industrial Electronics (ISIE 2002), Vol.3, pp. 711-716, 2002. W. Wang et al., “An adaptive incremental predictive current control method of PMSM,” 2013 15th European Conf. on Power Electronics and Applications (EPE), pp. 1-8, 2013. H. Liu et al., “The parameters identification of PMSM based on model reference adaptive,” 2012 2nd Int. Conf. on Consumer Electronics, Communications and Networks (CECNet), pp. 687-689, 2012. K. Wiedmann and A. Mertens, “Self-sensing control of PM synchronous machines including online system identification based on a novel MRAS approach,” 2012 IEEE Symposium on Sensorless Control for Electrical Drives (SLED), pp. 1-8, 2012.